Granola. It and my family have a love-hate relationship. We love granola and hate that we can’t find a safe and tasty granola all of us can enjoy. I am gluten-free and my son is peanut and nut-free (also chickpea and sesame free). As most of you already know, it’s not easy to find a granola that meets all of these dietary requirements. The blurry photo is so attractive, I know. But that’s what happens when you are trying to take a picture and hold the family back from early taste testing. The company is family-owned and operated and owns all of their own machinery. Because of this, they are able to guarantee every product they sell is made from all-natural ingredients and is free from the top 8 major recognized allergens: gluten, peanut, tree nut, soy, dairy, milk, egg, sesame, shellfish, and crustacean. That “free-from” list is enough to impress all on its own. Still, I was skeptical because I haven’t found a granola yet that is free from the top 8 allergens that doesn’t taste like a clump of sawdust. Despite my skepticism, we ripped this package right open when it arrived. Hope lives eternal, I suppose! And thank goodness for that…because Gerbs granola is a total WINNER! The granola has a great rich, crunchy texture with just a hint of sweetness. We received the Original Blend Granola which is composed of roasted oats, roasted sunflower seed kernels, sunflower oil, honey, roasted pumpkin seeds, and roasted brown flax-seed. It was fabulous! We are nearing the end of our bag which makes me a little sad, but we have put it to excellent use! So far, we’ve used the granola on cereal, mixed with yogurt, and mixed into cookie dough. Every single combination experiment was a hit! Liking what you are hearing about an allergy-friendly granola? Well there’s more! 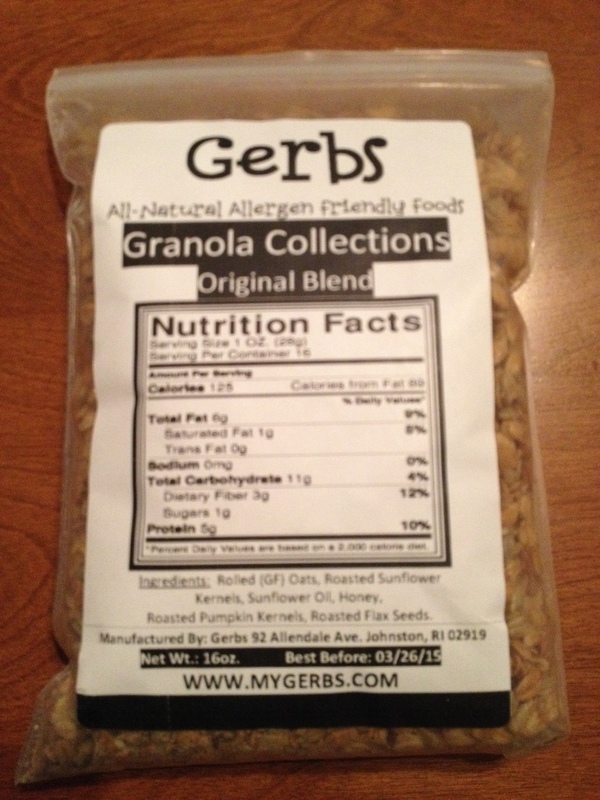 Gerbs also produces seeds, salad fixings, snack mix, oats, flours, rice, crackers, pretzels, and a whole host of other allergy-friendly goodies. Bottom Line: This is the best gluten, peanut, nut, and sesame free granola I have found on the market to date and imagine I will be a repeat customer. I love that the company is so allergen-friendly and takes great pride in their products! Thank you, Gerbs! Thank you for the wonderful review ….. stay with us, we are about to blow the doors off the Allergen community …. we’re working on Java Seeds, Granola Bars, and Panned Dark Chocolate Seeds & Dried Fruits! Hi! I have nominated you for a Liebster Award to help promote your blog. Details can be found on my blog http://soysurvivalist.wordpress.com/.